← Who are you scamming now? Forbidden fruit, please pass a napkin…. What’s happened to human etiquette? Or for that matter, even human decency. As most of us do, I found myself addicted to a less than proper television show…. I’m ashamed to admit I’ve been watching “Here Comes Honey Boo Boo”. Here’s why I’m ashamed to even admit I left it on the channel, let alone seek it out for an evening alone. The very first episode I watched, two of the girls were taking etiquette classes. The language, farting and burping at the table where horrifying… I can’t believe anyone would allow their children to act in such a disgraceful manner in front of a stranger. I’m sure all of us have had less than graceful manners in front of our own family, but in front of a stranger? Just let baby blue eyes try it. There is a lack of class in their family. There is no grammar, no manners, and no restraint on junk food. The junk food is another manner in and of itself; I won’t get into that here. This is what’s sad to me… I actually felt bad for their new pet pig. Pigs are an intelligent, clean animal despite their bad rep.
And yet, I did not change the channel. No, I sat there for one more half hour and watched another episode in which June (the mother) goes on a date with her boyfriend and the youngest gets ready for a pageant. I will respect that June made an effort to look nice for her date, I wish we could have put her on What Not To Wear for it (hint hint TLC http://tlc.howstuffworks.com/tv/here-comes-honey-boo-boo, it’s your channel), but at least she put her best foot forward. The three older daughter received pedicures while the mom and youngest got facials. That’s a nice thing for them. But as a studying cosmetologist, I would be appalled at the thought of hosting an entire family with their mouths. It was rude and not at all the appropriate behavior for a spa. There didn’t seem to be any other guests, but I could imagine they’d leave quickly with that family there. The poor girls who did the pedicures where very vague in their interview answers and kept it very diplomatic. I congratulate you ladies; I’ve seen lesser women lose their cool at events like that. What has this world come to? 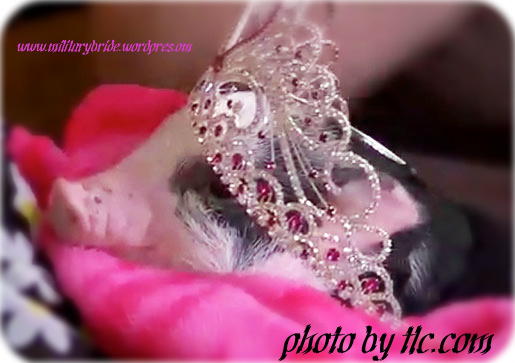 This little girl is a beauty pageant girl…. that’s why she has her own show, but honestly? I’d like to give that whole family a smack upside the head. Teach those kids some respect for other people. Teach them how to not embarrass themselves and other people in a restaurant. And for goodness sake, please please teach them some grammar. Does anyone feel the same? Please don’t hesitate to let me know how you feel about it. Posted in Baby, hubby, Life Lessons, military, military family, milspouse, mommy, Parenting, pets, Uncategorized, veteran, wife and tagged beauty queens, children, grammar, manners, milhubby, military wife, milspouse, pageants, Pets are kids too, respect, table manners, television. Bookmark the permalink.